100% Woven Cotton Bag - Express Corporate - Promotional Products - Delivered Fast! 100% Woven cotton bag with 750mm shoulder handles. 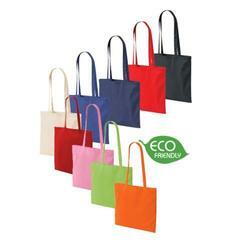 A fantastic environmentally friendly item, perfect size for exhibitions and shopping. Price includes a 1 colour print 1 position.